To have a wood door built and carved by Ramon Figueroa was a big deal. 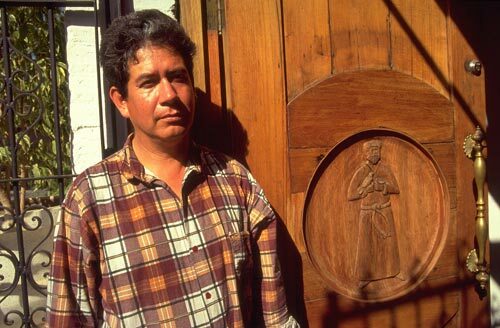 Ramon Nicholas Figueroa Castro was one of the most respected artists-craftsmen in Alamos. Members of the North American community spoke of him in hushed tones reserved for masters and maestros. Any visitor that asked about local creative talent would learn about Ramon and his growing reputation outside of Alamos. Many locals recognized a Ramon carved door as a collectable piece of art, hard to come by for a variety of reasons: he works slow, he is busy with a growing client waiting list, needed materials were hard to find, he is expensive because of his rising profile and, or… If one managed to purchase a Ramon it became the opening to countless conversations. The Ramon I met was quiet spoken with a soft smile and simple gestures. It seemed he did what he did because it was what he did, there was a simplicity to his movement. Everything else surrounding his work was what other people did because it was what they did. Ramon hoped they would pay him what they had agreed to pay him and he would be left to his work, after-all, it is what he does. Ramon together with his wood working brothers at their shop. 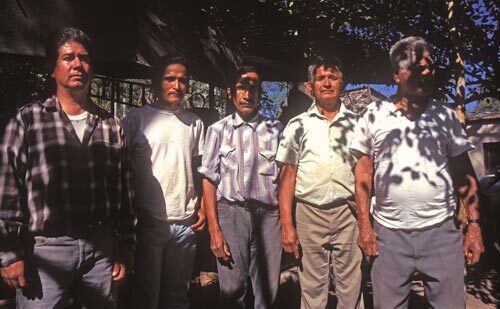 The brothers Figueroa all worked with wood on their family property on Calle de las Delicias. Manuel, Emir Yonolan, Wilson, Paul, David and Ramon, not in the other of the above photo, shared a sprawling work space both open air and under roof. There were few walls: nature came in and their wood creations went out. 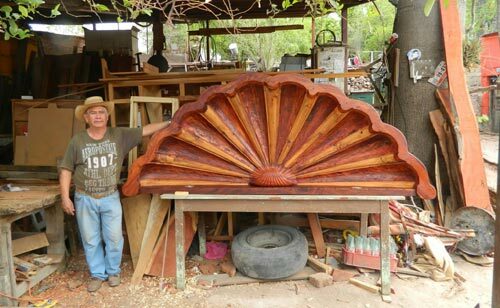 Trees provided shade for craftsmen making tables, chairs, windows, doors… On this day Ramon was finishing a beautiful bureau. Its elegant turnings and graceful details stood out in sharp contrast to the dirt floor. Humberto Enríquez sent this photo of Ramon Fiqueroa. Ramon stands proud amongst his tools, materials and hand crafted objects. 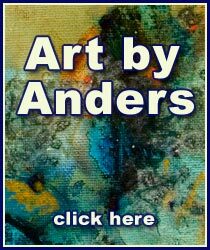 Is he finding comfort in his skills and artistry? Could it be that part of Ramon’s journey was his last work would be one of his best works? This is a path many artists follow. ©2014 Alamos-Sonora-Mexico, all rights reserved by respective photographers. “Here is something Special”, Spanish explorer Vasquez de Coronado noted in 1540 as he headed north, passing by tall white rocks on Alamos de Sierra. This is the opening chapter to “A Short History of Alamos” written, filmed and edited by Anders Tomlinson. Narrated by Bruce Miles. Soundtrack by AtomicSonics and Estudiantina de Alamos. Juan Batista de Anza departed Alamos in September 1775 with silver, and local families, to settle “Monterey and the Californias”, including San francisco. Another expedition, five years later, left Alamos to settle Los Angeles. Pember, Elizabeth and Kit Nuzum, Puerta Roja Inn, Estudiantina de Alamos, Quartet de Alamos, Los Angeles Cathedral Choir, Museo Costumbrista de Sonora, Antonio Estrada, Francis Curry, Antonio Figueroa, Teri Arnold, Sharon Bernard, Rudy Hale, Chaco Valdez, Dr. Joaquin Navarro, Ernesto Alcorn, Antonio Mendoza, San Sanchez, June Ray, Swickards, Meisenheimers, Frielobs, Cooks, Stephanie Meyers, Bruce Miles, Earle and Joan Winderman, Doug Reynolds, Robert Ganey, Gary Ruble, AtomicSonics, William Brady, R. Harrington, Donna Beckett, Del Mar TV 38, Robyn Ardez and all the people of Alamos for their grace, warmth and hospitality. An occasional summer storm floods three arroyos in Alamos with mountain runoff. Throughout the summer there are activities to enjoy in Alamos, Sonora, Mexico. On this day the rodeo came to town along with a Mexican pop singer who was backed up by the local “Halcon de Sierra Alamos” band. The stars of the show, which started late, were the dancing horses. To the east, the Cuchujaqui River is a nearby Alamos summer getaway. The Cuchujaqui River is to the east of Alamos, Sonora, Mexico. Three arroyos join together in Alamos and flow to the Cuchujaqui River, on to the El Fuerte River and ultimately the Pacific Ocean. It is a cooling retreat for Alamos folks especially in the hot summer. On this day, Antonio, an Alamos dentist, spear-fished one bass, a couple of catfish and many carp. Lightening on a warm Alamos summer evening is a show to remember. The romantic Plaza is a wonderful vantage point. Rolling thunder punctuates child’s play and lovers embraces. Daybreak in the Plaza is a quiet song that slowly builds into a symphony. As the day turns from dark to light watch Alamos come alive. Everyday is a new start, another challenge, another opportunity. 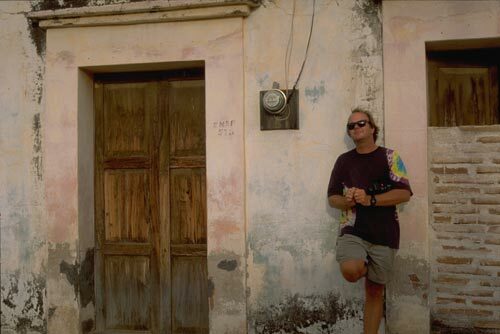 The late Levant Alcorn is seen collecting bird feathers on his morning walk around the Plaza de las Armas. Estudiantina de Alamos performs before a packed Plaza as a film crew captures the event. It is a big day in the Plaza. A TV crew has come to town and is filming a music concert. Estudiantina de Alamos, a crowd favorite, is performing. They will also back up several other acts. The bandstand is surrounded by adolescent girls and an scattered smiling mothers. In mid-afternoon the air pressure begins to drop and a stiff wind sweeps the valley from the west, a storm is coming. Night falls and showers start. We go from the Plaza to the Alameda and back. The following day the sun comes out and then is covered by clouds. Kids play and men work gathering sand in the arroyos. A summer day can be complex in its textures and atmospheres. If ones wants to have fun, one can have fun. And today Alamos is smiling. The season’s strongest storm passed through in early September. A couple of weeks later there was still a little water flowing in the arroyos. Celebrating Mexico’s Independence Day, thousands of folks, young and old, gathered in the Arroyo de la Aduana north of the Plaza. Dancing horses, music and beer is everywhere. Folks from all over the Alamos region gather in the arroyo to celebrate Independence Day. And the celebration in the arroyo continues. Everyone wants to have a good time and enjoy the warm sun, brillant blue sky and the murmurs of running water. There is much to do and see. The party will continue late into the night under beautiful Sonoran stars. How romantic. Alamos is home to the jumping bean along with elements that touch all the senses. This video features the jumping bean, a drive into town from the west, and several cameos: church bell ringing, closeup of flood waters, timelapse of clouds passing in front of Mt. Alamos, and a street puddle at night reflecting shimmering light. Estancia Crysalis, along the El Camino Real, is a mile southeast of the Plaza in Alamos, Sonora, Mexico. The 140 acre ranch, on Sierra de Alamos sloping foothills, is focusing on a new day. And new opportunities gliding on tropical breezes. Neighboring towns come to Alamos in the spring and celebrate their Indian Heritage. Indian Day comes to Alamos in the Spring. Villagers from around the Alamos region come by bus to the Alameda and celebrate their native culture. Dancers, musicians and exhibits fill the business center with color, motion and music. Nacion Mayo and Nacion Popagayo are some of the regional dancers, musicians and exhibits competing in front of a panel of judges. It is a warm spring day as we explore the “Pantheon” – (Cemetery) on the road to the Sierra Madres, minutes east of the Colonial Center. The ages speak here. Be it ancient mountain sounds or human voices, mourning and celebrating since 1794. All is timeless, and all thoughts are a point on our circle of life. It all begins and ends in the Working Center of Town. The Alameda, center of activity, transportation hub, bars, offices, shops, gas station and markets … This is Mexico working, traveling and playing. Boom boxes serenade food carts and shoe shines. Alamos has a 5,000 foot runway, at 1,300 feet elevation, awaiting your landings and takeoffs. The Alamos City Airport, to the west, is minutes away from downtown. Talk about arriving first class. Behold a Cornucopia of Color, Shapes, Textures and Scents. Alamos has six seasons a year and a diversity of native and imported flora. Gardening is both a passion and industry. It can become all consuming. It can be an mental oasis, freedom from the outside world’s cares and concerns. And it is something to share with those who visit, be it bug, bird, mammal or human. 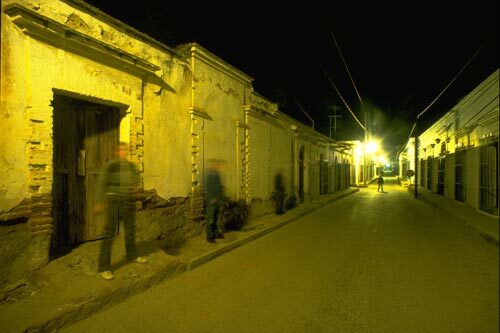 The Streets of Alamos, Sonora, Mexico become Another Time in Another Place. Easter week in Alamos is a special Spirit. Viernas de los Delores is celebrated on Good Friday. Decorated altars are displayed in windows and doorways throughout town. In the evening people stroll the streets viewing these commemorations of Christ”s suffering. In this segment we join a reenactment of the Crucifixion through the streets of Alamos to Guadalupe Hill. Fast paced music video that is more than its parts, much like Alamos itself.. This is an experimental clip that weds close-ups textures shot out a moving car’s window and 120 blended stills images of Alamos life. High speed video at its best. Alamos, Sonora, Mexico has never looked like this. Today, the spirits of these departed steeds, proud Arabians, are present, be it a sound of a branch breaking under weight or a small flurry of dust. Shut your eyes and listen, they are still here. Buckle-up as we take a super fast car ride through Alamos on a grey winter day. Driving Across Alamos on an overcast December day starts at La Puerta Roja Inn. We head east and circle the Plaza de Las Armas before heading to the Panteon – Cemetery. We head back to La Puerta Roja exploring different routes. The best way to travel is walking. A parade of lights brings song and joy to colonial Alamos streets during Christmas. We see a traditional Posada visiting from house to house and arriving at Casa de los Tesoros where children in their holiday attire play and adult family take in another Christmas in Alamos. It is a tradition. Another scene is a trip to the Alameda. This is the introduction to a film that was shot over the 1993 winter holidays in Alamos. This is a glorious season for the town. We start out at the airport and head east into town and visit the Alameda lined with stores and professional offices. Music is part of the Alamos fabric, the Alamos way of living. Time stands still: a river moves on and letter-press printing continues. 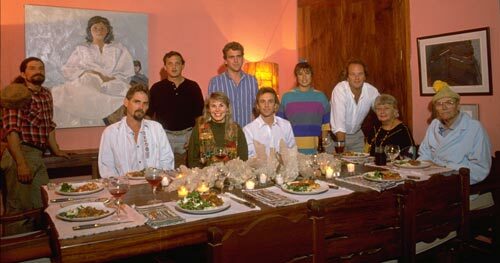 Two days before Christmas 1993 the film crew travels out to the Rio Cuchujaqui. It is a world unto itself but not that far away from Alamos. And then we visit a print shop that has been in operation for over 100 years. Alamos had the first printing press in the Californias. One wonders if these presses are still at work. Letter presses have an imprint-edge that can be felt with the fingers and the soul. They come from all over the region with things to buy and sell. Sunday, north of Arroyo La Aduana, there is an open-air market filled with people and music. Meals, snacks, produce, clothing, toys, tires, bikes, tools and what ever folks bring to sale fill out both sides of a colorful promenade. It is a wonderful place to shop and meet neighbors, family and friends, new and old. Kite flying is popular in Alamos, Sonora, Mexico. Drinking beer outside the pickup with friends is popular. Fun and work go on side by side as we visit a wood shop. Night is Filled with Sounds and an Occasional Lull of Only Stars Whispering to Each Other. The Bells of Alamos ring through the day and night. They have for over two hundred years. We visit the bells as they are being rung, watch folks mill about the Plaza and enter the church from the belfry. And then it is out for an evening walk from the Plaza to the Alameda. And the steps we take have been taken for hundreds of years. Towns Live On Through the Skills and Attention of Its Maestros, Craftsmen and Laborers. Walking is a common choice of transportation in Alamos, Sonora, Mexico. To school, work, play, church, shopping to the buses. 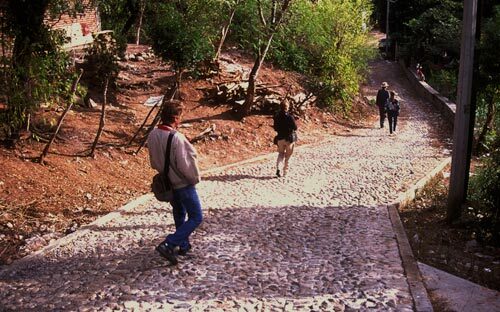 There are taxis and cars but walking is the Alamos way for most. And in the day wherever you walk there are workers at work. Big jobs, little jobs, it is all work. Exuberance is Everywhere: Listen for the Laughter of Youthful Rhythm. Kids playing games on the streets of Alamos is a common fabric of everyday life. We also tour a couple of homes and their gardens. Smiles are honest and come easy. It takes a Village to Make these Films. Here are, left to right, Chaco Valdez, Anders Tomlinson, Gary Ruble, Donna Beckett, Robert Harrington, Robert Ganey, Jo and Kit Nuzum, and Elizabeth and Pember Nuzum. Rudy Hale and Teri Arnold also provided assistance. A fine time was had by all. Photo-Gary Ruble. Behold a Cornucopia of Color, Shapes, Textures and Scents.The flora of Alamos is the many splendors of Sinaloan tropical forest and Sonoran desert living together in unexpected harmony. Many properties have gardeners watering, pruning, consulting, planting, cutting, raking, commiserating, trimming and… year round. Flowers and vegetables are planted in November for winter blooms and crops that last until May or June’s heat… Mangos, papayas, bananas, palms, amapas, orchidias and other trees provide food and shelter for native and migrating birds. Cascades of colors come from flowering vines: blue veracruzana, orange trumpet, red, magenta and orange bougainvilla and… And the smells and scents that envelope one’s senses… Formal, informal… it all contributes to this symphony and riot that is the passing seasons in Alamos, Sonora, Mexico. Mt. Alamos is some 6,500 feet above sea level. It towers 5,000 feet above the town of Alamos. It is another world, wild parrots, dry tropical forest, granite and… Up and down is a day’s effort, it is well worth it. To reach the top it is recommended to start hiking early while it is still dark and cool. Here, seven miles west of Alamos, at 2,500 feet elevation with surrounding mountains as high as 4,700 feet, Aduana has a few hundred people where once there was 5,000. A church, country store, cemetery, a small restaurant-inn, a plaza with a dry fountain in its center are surrounded by the past. Spanish conquistador Vasquez de Coronado camped here during the winter of 1540-41. He was searching for gold in what turned out to be mountains with veins of silver. The mines closed in 1906 after nearly 400 years of continuous mining. La Aduana was the “custom office”, it was all about taxes and royalties. It is another day in the graveyard. Not just another day… but another day. It has been this way since 1794 when this plot of land was deemed the municipal cemetery. Graveyards are a special place: they are public art, they are public history and they are markers of their own civilization. And another day begins… and somewhere out there someone is dying and somewhere near here someone is being born. In the end it is all about this precious balance we call life. The summer rains are here, the sweet night air cools warm bodies bringing relief and contemplation. The purity and hope of laughing young couples, alone with each other, drenched to the bone, clinging wet clothes, make their way home late at night splashing and dancing in cobblestone puddles. Above, the heavens explode, a cannonade of thunder rumbles across silhouetted mountain ridges backlit by fantastic lightening. It is time to go to asleep under one sheet in the cool of a warm night. And then the big storm, remnants of a tropical typhoon, arrived. In an instant the sky turned angry dark, the air became colder and a deafening wind shrieked through the trees. It rained and continuously howled from late afternoon until just before dawn. In the morning, stunned town folk came out and watched from a safe distance the fast running rivers that are normally dry arroyos. Over the coming days waters receded, children played in cool shallow pools and rock men filled their trucks with fresh sand. Photos and editing by Anders Tomlinson. The commercial center of Alamos, Sonora, Mexico, the Alameda, was laid out in 1769 and it has been busy ever since, some decades more than others. Today, it is bustling with activity. The bus station is the transportation hub for surrounding towns and ranches. he Alameda, center of activity, transportation hub, bars, offices, shops, gas station and markets … This is Mexico working, traveling and playing. Boom boxes serenade food carts and shoe shines. These images were shot in 1996. The Alameda is different now. Hurricane Norbert, on October 12, 2008, flooded the Alameda and took out the giant cottonwood shade trees. It remains the commercial center. It is a wonderful feeling to sit with a friend in the plaza on a pleasant evening. Here, one can watch people come, be and go. This is the a place to be seen and see. When all have come and gone it becomes a romantic refuge for a young couple. Imagine horse drawn carriages, burro pack trains, and cars that have come into Alamos along these streets. Imagine the families that have been here for centuries. Imagine the change of government, some peaceful some violent. It is all here in the shadows of night. Photos and editing by Anders Tomlinson. Oh little town of Alamos. Lights sparkle in the evening darkness. Pungent smells float with the shifting breeze. Music, live and recorded, rises up from the homes and neighborhoods. Birds sing under star filled skies. Dogs bark and cars pass by. Footsteps on cobblestone and smoke from fireplaces create mystic moments. Children of all ages play late into the night on the quiet streets. Night time is not threatening, it is a celebration of another day both coming and going. Night time is magical. The town seems smaller. The world becomes all you can see looking down a street. It is easy to focus on the smallest thing. And behind the walls there are other worlds: private legacies, conversations., comforts, learnings, entertainments, deliberations, dreams. This page took 0.469 seconds of computer labor to produce.